Could the SW Have a “Hurricane Sandy”? The most obvious analogy for a Southwest Hurricane Sandy would be a flooding event. Monsoon storms in parts of the region regularly cause flooding, but it is usually short-lived since the storms normally only last a few hours, so they don’t have the capacity to create serious damage like Hurricane Sandy. El Niño events here, however, as many are aware, can create serious flooding over several days. The 1982-83 El Niño, one of the strongest El Niño events of this century, led to torrential storms and widespread flooding across the Southwest, as well as in many of the Gulf states. Total damage costs in the U.S. were over $2 billion and the death toll exceeded 160 people (http://www.stormfax.com/elnino.htm). Hurricane Sandy, in comparison, resulted in at least 125 deaths in the U.S. and upwards of $62 billion in damage. There is a big difference, however, in the potential for damage between the two regions. The northeast U.S. is the most densely populated region in the country, making it more vulnerable to extreme events. But an even bigger reason for the much greater damage from Hurricane Sandy relative to the 1982-83 El Niño event is simply that it was more powerful, with tropical-force winds and storm surges as high as 13 feet. With most of the Southwest being landlocked we don’t have to worry about impacts such as these. Even the California coast doesn’t experience hurricanes of this magnitude. What about heat waves or wildfires? Here we’re accustomed to high temperatures, so a heat wave is unlikely to cause significantly more damage than our typical hot temperatures. 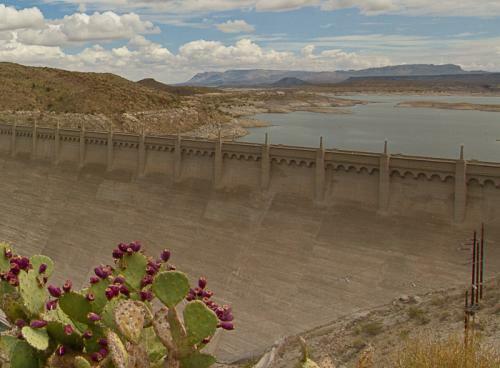 In the more mountainous portion of the Southwest, however, a heat wave, especially in the winter and lasting more than a few days, could wreak havoc by melting snowpack, leading to major flooding. But I would argue this would still not cause enough damage to begin to compare to that created by Hurricane Sandy. Wildfires, on the other hand, have the potential to rapidly destroy buildings and lives, and can cause billions of dollars in damage. Could they be our Hurricane Sandy? Just like hurricanes, they’re fast, with only a few days’ notice, are scary and unpredictable, and can devastate the landscape and structures. However, even though there have been many wildfires in the recent past that have burned a record number of acres, these fires tend to be further away from urban centers and still aren’t as far reaching as hurricanes, which normally span several states, even countries. Compared to Hurricane Sandy, this scenario definitely has the potential to create substantial damage. Another winter of well-below-average snowpack could create far-reaching water shortages spanning multiple states and Mexico. It also has the potential to cost billions of dollars, as did the extreme drought in Texas last year. There is a big difference between drought and Hurricane Sandy, however: With Hurricane Sandy, the region had probably one week’s notice at the most, whereas the effects of drought come on over the course of months (or years, for those who listen to predictions of climate change in the region). This doesn’t necessarily make planning any easier, but at least the time is there. On the other hand, people can’t just evacuate from a drought, as they can with hurricanes, because droughts last months to years and it’s nearly impossible to determine when the “worst” part will hit. Luckily, here in the Southwest we seem to be immune to the kind of fast-hitting, widespread catastrophic weather events as Hurricane Sandy. But that doesn’t mean we still don’t feel the effects of other weather or climate extremes that may last years (such as severe drought), weeks (such as wildfires), or days (such as flooding from El Niño events or the monsoon). Looking at all of these extremes, severe drought is probably the closest thing we have to a Hurricane Sandy scenario in terms of the potential cost of damage and lives affected. But what are your thoughts? Do you think any of these extremes I mentioned (or any others) could create the magnitude of damage that Hurricane Sandy wreaked on the east coast?